Do you remember Amanda's maternity photos? Well, someone from The Bump magazine contacted me about using a photo in their upcoming Boston issue. From the creators of The Knot, Bump Magazine is dedicated to all things pregnancy and baby! Of course I was thrilled and said yes! Click here to read the article which talks about maternity sessions and large wall portraits! Boston ladies - Be sure to pick up one!! I’m looking for high school Juniors! Please contact me today! 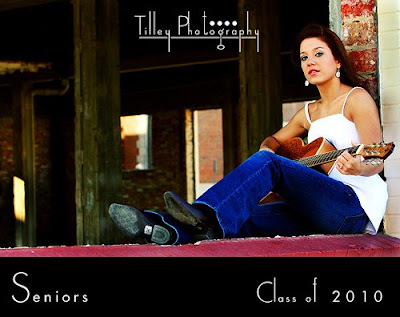 I am looking for high school Juniors to be my Senior Reps for the Class of 2010!!! You will be a representative at your school for Tilley Photography. You will pass out cards with your own photos on them and get your classmates excited about senior portraits. I promise no stuffy fake backgrounds here – just fun custom senior sessions that you will WANT to show off. Also, you’ll keep an eye out for who you think will be a great rep from the Class of 2011! You get two free sessions: one in the spring and one in the fall. The first session must be completed in June for your rep cards that you will be handing out. You’ll get free prints from each session, 50 senior contact cards (in addition to rep cards), and unlimited web images to share via Facebook and email. There will be prints, money, prizes and free goodies for referrals, including an iPod Touch for my top representative! Already have an iPod Touch? Then you’ll get an iTunes gift card worth $200. You also receive 50% off any other service or product with me during your rep program. I may also offer additional specials just for you throughout the year. Your images may be used on my website and in promotional materials, so your parents’ permission and signature is required. It all depends. Most schools require you to use their contracted photographer. But the sittings with them are free and include the yearbook submission. I *DO* offer them and will also provide a free yearbook submission as well for students who prefer to use me for the yearbook submission. Check with your school for requirements. I have the standard yearbook backgrounds and senior drapings if this is required. Your shoots with me are on location and customized for you. Before or after the on-location shoot we will take the studio senior shot at my home studio. Deadline is June 1st or until I have filled the positions. I will post here when school positions are filled. 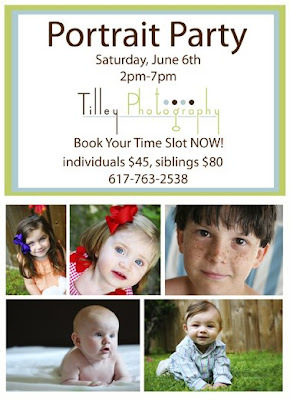 Portrait Party, June 4th and 6th! Where: My house, rain or shine! If it rains, we’ll do some stuff indoors. So, what’s a portrait party? It’s a mini portrait session with all the frills of a full portrait session. You get a password protected online gallery with 10-15 touched up images, two 5x7’s, 4x6 proofs of each image to keep, and four digital web files to share. * You will also get 30% off all prints and canvas wraps for a limited time after the portrait party. Sibling sessions are one hour and include four 5x7’s, 4x6 proofs of each image and 6 digital web files. One lucky person from the session will win a disk with all the high resolution images (print quality). Payment is required to reserve your spot!!! Call or email me today! Tip: Make sure younger ones have been fed and have had naps. It makes a WORLD of difference.